Today the little Wren comes out to join us. Its shrill little voice will be the one that cuts through goodness knows what kind of clap-trap and reveal the truth. The thing is, with it being Monday, that might not bode too well. What else does this little bird say to you? I see that it is set in the depths of winter. Not surprising, since it was sacrificed on St Stephens Day (December 26th) and there are various stories of that Saint and this bird, told around the World. What gets me with this little bird, is that whilst I’ve heard it, I hardly ever see it. Its song is somewhat distinctive though. When you hear it, what do you hear? What does the Wren say to you? To me, it’s a message to sit down and listen. Listen to those around you, listen to what is around you. It is also a case of listening to what is not being said or how something is said. If this card were to come up in a reading (and it does!) how its interpreted depends on the position. In the past position, you either did listen or needed to. In the present position, you really ought to listen. In the conscious position, you’re making an effort to listen. In the unconscious position, you’re listening, even if you don’t think you are, it’s coming to you by osmosis (or eavesdropping!) and in the future, you might want to listen to what it offered as advise. 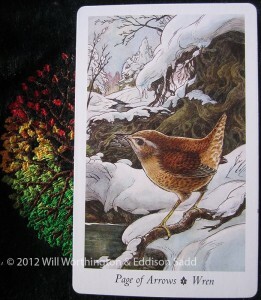 How the Wren appears to us depends on what we need at the time. During a day, we can be needing all 5 positions I described above. With children, you probably will need to make them listen to you as much as you need to listen to them. Listening is important, from the time we’re able to talk, we’re told to be silent and listen. That is because we learn more. We have two ears and one mouth. Between which there is a brain. I’ll have to engage mine today, please also, can you do the same? If you’d like your own personal Tarot reading, you can book your time slots via this page.